I’ve been making these Pumpkin Cookies forever. If you’ve been reading MBA for any length of time, you know that I’m not much of a repeat baker. 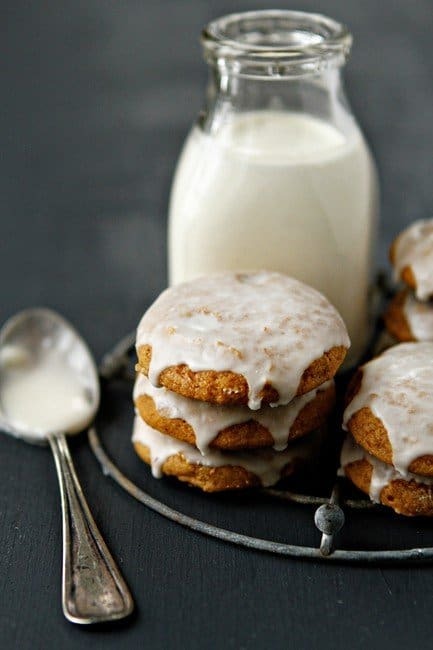 However, these soft, cake-like pumpkin cookies are a delicious exception. I don’t recall making a cookie like this with my Nana, but for some reason the recipe always reminds me of her, which could be why it’s been a Fall favorite for so many years. Last weekend, I was whipping up my fourth batch of Homemade Pumpkin Pie Spice in recent weeks – I’m telling you guys, I am mildly obsessed with this stuff. As I was shaking the fragrant mixture around in a jar, I started to think about these cookies and within minutes, the batter was whirling around in my KitchenAid. I have posted two variations of this basic pumpkin cookie recipe on MBA in the past. Once with cream cheese frosting and again with a caramel glaze, but this time I decided to keep things a little more laid back with a simple powdered sugar glaze. There was only slight problem – I was out of milk. Well, let me rephrase that, I was out of usable milk. I really need to clean my fridge a little more often. After a quick refrigerator scan, I decided that I’d make do with a little Vanilla Natural Bliss Creamer from Coffee-Mate and the results were quite delicious. If you fancy vanilla creamer in your coffee, definitely give this one a whirl. It’s sweet and creamy and made from cream, milk, and sugar, so it doesn’t have that weird oiliness that some creamers have. And not to mention, it makes one hell of a pumpkin cookie glaze! 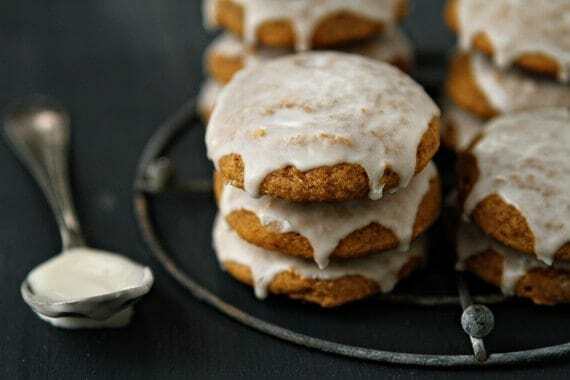 Whether you’re looking for a holiday cookie recipe for an upcoming party, or you just feel like eating your feelings – I promise you, Pumpkin Cookies are the way to go! 1. Preheat oven to 350°F. Line a baking sheet with parchment paper or a silicone baking mat. 2. In a large bowl, combine flour, baking powder, baking soda, homemade pumpkin pie spice, and salt; set aside. 3. In the bowl of stand mixer fitted with the paddle attachment, or in a large bowl with an electric mixer, cream together the butter and sugars. Add pumpkin, egg, and vanilla to butter mixture. Beat on medium speed until fully incorporated and creamy. Slowly add in dry ingredients and mix until combined. Using a medium cookie scoop (1 1/2 tablespoons), drop dough onto prepared cookie sheets. Spray the bottom of a glass with nonstick cooking spray and ever so slightly, flatten the tops of the cookies. 4. Bake in preheated oven for 12-15 minutes. Allow cookies to cool on pan for a few minutes before removing them to a wire rack to cool completely. 5. To Make the Glaze: Combine confectioners' sugar, creamer OR milk, melted butter, and vanilla. Add milk as needed, to achieve glaze consistency. 6. Place a piece of parchment or wax paper on your work surface and place a wire rack on top of the paper. Dip the top of each cookie into the glaze and place the cookie onto the wire rack allowing the glaze to drizzle down the sides of the cookie. Allow glaze to firm up before serving. - If you are using milk for the glaze, I would suggest bumping up the amount of vanilla extract to 1 teaspoon. - These cookies are best served the day they are made. However, if storing them, I recommend keeping them at room temperature. Do not place them in an airtight container as it could cause the cookies to become too soft and slightly sticky. These look beautiful and delicious!!!!! YUM!!!! Yum. I just finished a stack of pumpkin cookies this morning. Now it looks like I need to make another stack with a vanilla glaze. Ooh, these look absolutely perfect. I’m not much of a repeat baker either, but I bet these would make the list! These look delicious! I’m rarely a repeat baker myself, but I get why you’d make these more than once! These cookies are so adorable, they just scream (softly, though) winter! Pumpkin cookies are one of the best type of cookies out there. They are so soft and pillowy. I love them! I can’t wait to make these – they look amazing! Using the coffee creamer for the glaze is brilliant! Pumpkin cookies really are the best! I love the glaze on there too. They look excellent! These cookies look so pretty and delicious! I’m on a pumpkin tear myself and think I will bring these as a hostess gift for Thanksgiving dinner! I love the idea of these cookies. They’re like autumn in a mouthful! Your photos are gorgeous. Thanks so much for sharing! These are gorgeous and I bet so tasty! I’ve been going a little wild with pumpkin this weekend. And now you post this!? It looks incredible! These look amazing…so simple and pretty! 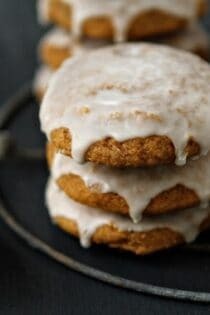 One of my favorite fall treats are pumpkin cookies! These look so good! Holy crap, these look delicious! I’m going to have to go buy more pumpkin just for these cookies. These look delicious! And, I love that you used a coffee creamer to make the glaze – why haven’t I thought of that before? Can’t wait to try it! What about a chocolate glaze? Can you direct me to a recipe for a chocolate glaze? Looks amazing Jamie, just like everything else you post =)! I’ve always admired your blog you do such great work! Made these last night, ate some warm and brought some to work. I will be making more these are yummy pillows of goodness! Thanks, Jamie! Mmm yesterday I realized I needed to make something with pumpkin and these were perfect! They baked beautifully and my whole house smelled like fall! Thanks for a great recipe! So happy that you enjoyed the cookies! Have a fantastic day! I made these last night for my coworkers and they loved them!! Thanks so much! Yay! I am so happy to hear you enjoyed them. Thanks so much for stopping by and sharing your experience with the recipe. Have a great weekend! These look scrumptious! Can these cookies be frozen? I haven’t tried to freeze these cookies and they’re quite delicate, so I’d be pretty careful if you attempt it. Thanks for stopping by! These look so good but I can hardly see the page for all the add pop-ups. Can you tell me what the cookies are like? Cake like, crispy?????? They are definitely more cake-like than anything. I hope this helps. These look really good,I am wondering if the home made spice can be substituted with store bought?.I have that here already. You can use store bought if you have some on hand. Thanks for stopping by. Will you share your recipe for homemade pumpkin pie spice? You can find the Pumpkin Pie Spice here: https://www.mybakingaddiction.com/pumpkin-pie-spice-recipe/ Thanks for stopping by.